Coffee & Tea 101 | What is Crema? Crema is a little bit of a Holy Grail in the espresso world -- folks are talking about it all the time, searching for it, measuring their technique, equipment and coffee by it. But what the heck is it? What does the production of crema give you? And is it really that important? Some of the bigwigs in the specialty coffee industry (such as James Hoffman) have proclaimed crema to be 'rubbish'; we won't go that far, because -- like everything with coffee -- it's really a personal preference. When we were at the SCAA convention in April, we went to a couple of lectures that talked about coffee preparation variables and how they effect the end result. From those lectures, we picked up the following tidbits of info that play a part in the formation of crema. First, let's define our terms here: Crema is the initial light/tawny colored liquid that comes out during an espresso extraction. It is what causes that 'Guinness effect' that folks sometimes reference. As the lighter liquid infuses with the darker liquid that comes after, it filters up and 'settles', leaving a tan colored layer on top of the darker espresso below. As the specialty coffee industry has grown more and more focused on quality, distribution, craft and flavor, crema was a hallmark for two different things: First, the bean's natural fat/oil content was higher and therefore could be assumed to be processed at the plantation in a preferable manner, and second, that the coffee had been roasted recently enough that it still had some C02 out-gassing from the beans. 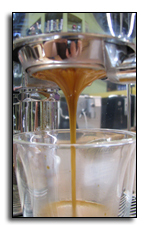 So espresso enthusiasts became very focused on the creation of crema as the most important element of good espresso. This isn't necessarily true. You can pull a beautiful looking shot that filters down and looks quite gorgeous, but that, in fact, tastes quite sour because the crema is the result of post-roast C02. Conversely, you can pull a delicious shot that has no crema at all because of the way the bean was processed at the plantation and how darkly it was roasted. Pressurized portafilters and superautomatics feature technology that aerates the coffee during extraction, to give the illusion of crema, but the flavor doesn't necessarily back it up. Plantation Processing - Beans that are naturally/dry or pulped natural/semi-washed/honey processed will naturally maintain more of their sugar and fat, resulting in more crema production during extraction. You'll find beans produced in Africa and Brazil to use these processes, with a movement in other Central and South American growing countries toward 'Honeyed' and/or pulped natural processing. Beans from moister climates (such as Sumatra) will have a very different taste and oil content to them because they are most often wet processed. Roast Date - How recently was your coffee roasted and how darkly was it roasted? While the 'sweet spot' for a coffee post-roast varies, pulling shots with coffee roasted less than 72 hours before will definitely result in an early blonding that is often mistaken for crema. You want some of the C02 for the emulsification of the fat, but not so much that there's no room for the coffee solids to actually extract. Roast Color - Darker roasts will bring more of the bean's natural oil to the surface, which will then transfer to packaging containers, grinders and your other equipment, resulting in less overall oil/fat in the coffee grounds themselves that can be emulsified. So you will likely often see that darker roasts can produce less crema. Espresso Machine Tech - Pressurized porftafilters aerate the coffee during the extraction, giving the illusion of crema. Similarly, superautomatic machines will often utilize technology that will produce the look of crema without it actually being the emulsification of the fat/oil and the C02. This makes these machines 'user friendly' but it's also kind of a hack and often doesn't taste as rich or complex as shots pulled via traditional extraction methods. You can also watch Gail discuss crema in this informative video.